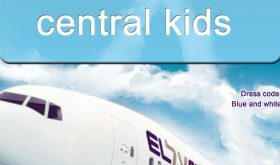 Shabbat morning 17th June Kiddush talk: “The west, Israel and the challenge of Islam”. 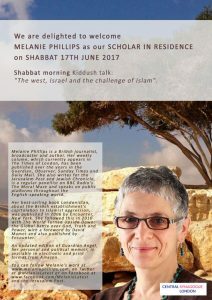 Melanie Phillips is a British journalist, broadcaster and author. Her weekly column, which currently appears in The Times of London, has been published over the years in the Guardian, Observer, Sunday Times and Daily Mail. 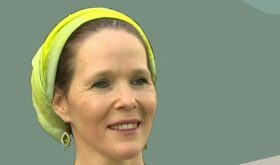 She also writes for the Jerusalem Post and Jewish Chronicle, is a regular panellist on BBC Radio’s The Moral Maze and speaks on public platforms throughout the English-speaking world. Her best-selling book Londonistan, about the British establishment’s capitulation to Islamist aggression, was published in 2006 by Encounter, New York. She followed this in 2010 with The World Turned Upside Down: the Global Battle over God, Truth and Power, with a foreword by David Mamet and also published by Encounter. An updated edition of Guardian Angel, her personal and political memoir, is available in electronic and print format from Amazon.